One of the most effective and enduring military formations in ancient warfare was the Greek Phalanx. The age of the Phalanx may be traced back to Sumeria in the 25th century BCE, through Egypt, and finally appearing in Greek literature through Homer in the 8th century BCE (and, since, has been generally associated with Greek warfare strategy, the name itself being from the Greek for `finger’). The phalanx formation was a close-rank, dense grouping of warriors armed with long spears and interlocking shields. 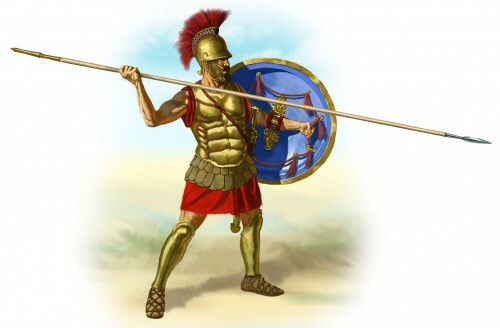 The Greek Hoplite soldier provided his own weapon (a seven or eight foot spear known as a `doru’) and shield as well as breast plate, helmet and greaves. There was no official `training’ for a Greek Hoplite and it was the responsibility of the individual commander to make sure his troops could fight in a unified form. Philip II of Macedon changed how armies were trained and enhanced the phalanx formation by introducing the idea of the ‘professional soldier’ to Macedon, providing his warriors with training, a smaller shield, and a longer spear known as a `sarissa’ which, besides simply being able to inflict greater casualties at a further distance, had the added advantage of masking the formation’s movements when the sarissas were held in certain ways. The strength of the Greek phalanx lay in the endurance and discipline of the soldiers who made up the closely-packed rectangular formation of shields and spears. Once the phalanx was formed the soldiers would advance slowly toward the opposing army, fending off missile blows with their shields and holding the formation tightly in order to break through the ranks of the other side. 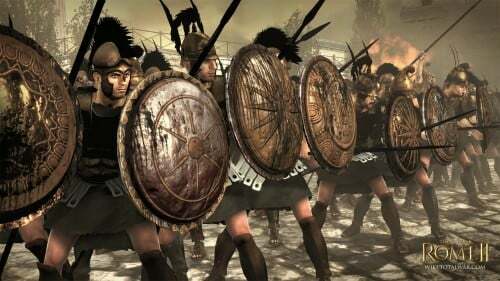 Since the use of reserve forces in battle was not conceived of before the 5th century BCE, a battle was decided by the formations initially placed in the field and, consequently, the men who made up the phalanx formations had to be prepared to outlast, as well as out-fight, their opponents. Once the antagonists engaged each other on the field the battle was on until one side broke ranks and was defeated. The phalanx, then, could be employed in battle in a great `pushing match’ with the front-liners literally being pushed forward by the shields of the soldiers behind them or, as the phalanx evolved, as a `battering ram’ to break the front lines while cavalry harried the flanks. One of the most notable uses of the phalanx was at the Battle of Marathon (490 BCE) where the Greek Hoplites advanced in formation `at a run’ (according to Herodotus) and decimated the lightly armed Persian infantry (a tactic later employed, in 480 BCE, at the decisive battle of Platea). The Theban General Epaminodas significantly altered the use of the phalanx at the Battle of Leuctra (379 BCE) in which he strengthened his left flank to a depth of fifty men, thinned out his right flank and center, and crushed the Spartan force in what has come to be known as `oblique infantry deployment’. Phillip II of Macedon, learning of Epaminodas’ tactic in Thebes, brought it back to his kingdom where he created the first professional fighting force in Greece outside of Sparta. He armed his men with the longer `sarissa’ spear (which had a length of eighteen feet) and much smaller shields than previously used. The shields afforded less protection but gave the formation the advantage of greater mobility in that, without the interlocking large shields, the phalanx could out maneuver an opposing force more easily. 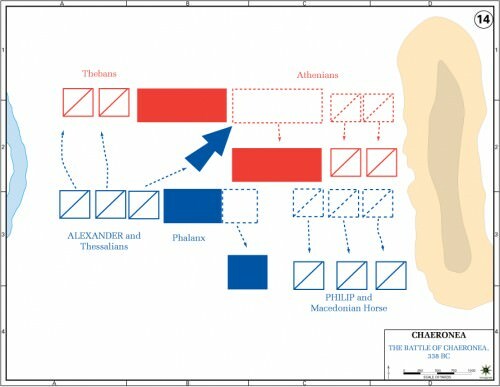 Phillip’s success with this variation of the phalanx can be seen in his victory at the Battle of Charonea (338 BCE) where his brilliant use of the formation, coupled with skirmishers and cavalry, crushed the combined forces of Athens and Thebes (both of whom employed the traditional Greek phalanx in their armies). The phalanx formation reached its height of effectiveness in the conquests of Alexander the Great who was able to move large bodies of men very quickly and whose brilliant strategies on the field made skillful use of the formation; but the phalanx steadily declined in use after Alexander’s death. At the Battle of Cynocephalae in 197 BCE, the Romans defeated the Greek phalanx easily because the Greeks had failed to guard the flanks of their phalanx and, further, the Greek commanders could not turn the mass of men who comprised the phalanxes quickly enough to counter the strategies of the Romans and, after this battle, the phalanx fell out of use. There are some historians who argue the phalanx was already obsolete by the time of Cynocephalae and the Greek commanders failed to use it effectively in that battle because its use was no longer properly understood. However that may be, the Romans themselves took up the phalanx formation and succeeded in using it to effect during the period of the Roman Republicbefore the formation was discarded in favor of the three-line Roman Legion with which the Roman Empire conquered the known world. Next articleThe Real Target of Social Media Censorship – VITAL Warning!